Bill Clinton totally gave his all, didn’t he? 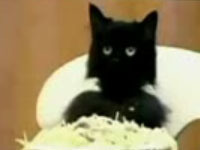 But I’m a little disappointed that the man from Hope didn’t bring up the issue that is most pressing: Spaghetti Cat. If the Democrats, and Bill Clinton, don’t want to deal with Spaghetti Cat, then I guess the Republicans will. I’m just saying. “Hey, America. It’s good to be here, a mile high, surrounded by supporters, the ones I love and the ones who love me, and, of course, my wife Hillary. You’re all my BFFs, as the college kids of today say. Hey America, sit down – I have a heart condition and can’t stand here forever. S’down! I’m here tonight to tell you to vote for Barack Hussein Obama. I’m not here to discourage voters to vote for Barack Hussein Obama – just as I wouldn’t discourage you to vote for someone named Peter Hitler Smith. No way. No McCain! Obama is a man who many say is experienced and ready for the job. And I agree that many actually say that, so that is why I’m here tonight – to tell you that many in our party think he can do the job and that’s important, if you believe them or whatever. And what about Joe Biden? What a guy. Hillary was gonna pick him, y’know? Yeah – totally was gonna pick him as veep. You know what I’m talking about. 18 million of you out there know. And you all know I’m from Hope, Arkansas, which is in the United States. In the heartland, but I don’t get me wrong, I don’t go back there unless I have to. But, Obama – Obama says he’s from Hawaii and that’s good enough for me. So, get out there and vote, and if things don’t go our way, we’ll know we tried, or something. And remember, Don’t Stop Thinking About Tomorrow, or 2012, whichever one – tomorrow or 2012 – it’s all the same. TTYL. < Previous DNC, night 2, Hillary!